Here’s an excellent two track 7” from Montreal’s Pop Stress, a generous gift from Megon at Only Death Is Fatal. This single, the only release by Pop Stress, was released in 1981 on Micatube Records. At first glance, the band seems heavily inspired by Magazine’s first two pioneering records. The A-side is a nervous pop song with bouncy organ synths and rock ‘n’ roll rhythms. It’s perfectly enjoyable in its own right, but the real gem here is the flip; a dark, tom-heavy, claustrophobic number that really gets under my skin. The song was allegedly inspired by Janov’s Primal Scream. 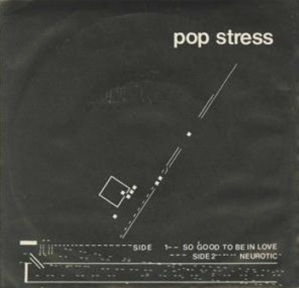 Pop Stress- So Good To Be In Love 7”.